HISTORIC Circa 1865 Appalachian Farm. Cabin & Barns have hand-hewn logs. Total rehabilitation project. Cabin will need...but not limited to...all new electrical, plumbing, well, septic & HVAC...as it does not exist. Electric service to home site. Heirs Grandmother was born in the cabin in 1866. 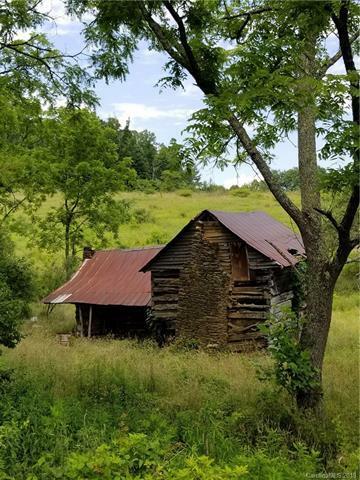 Heirs will separate Cabin & Barns on 10+/- acre tract to preserve the homestead. Will have road frontage & a 20 foot ROW across Tract 4, over existing driveway. Great laying land for an equestrian estate. 140+/- acres available, See MLS 3416598. 40+/- tillable & currently in hay, 100+/- Older Growth predominantly hardwood forest. Small branch flows though the property. Year round, long range views. Steep slope at very top of property. Lots of paved road frontage. Convenient (3 minutes) to Interstate 40. Minutes to Great Smoky Mountains National Park, Cataloochee Skiing and the Maggie Valley attractions. Cherokee's Casino OR Ashevilles Arts & Breweries are only a short 40+/- minute drive.